Load balancing is one of the essential factors to enhance the working performance of the cloud service provider. Cloud Computing is an emerging computing paradigm. It aims to share data, calculations, and service transparently over a scalable network of nodes. Since Cloud computing stores the data and disseminated resources in the open environment. Since, cloud has inherited characteristic of distributed computing and virtualization there is a possibility of machines getting unused. Hence, in this paper, different load balancing algorithms has been studied. Different kinds of job types have been discussed and their problems have been reviewed. In the cloud storage, load balancing is a key issue. It would consume a lot of cost to maintain load information, since the system is too huge to timely disperse load. Load balancing is one of the main challenges in cloud computing which is required to distribute the dynamic workload across multiple nodes to ensure that no single node is overwhelmed. G. Patela, R. Mehtab and U. Bhoic, "Enhanced Load Balanced Min Min algorithm for Static Meta Task Scheduling in Cloud Computing," Elsevier, p. 545â€“553, 2015. Chun-Chieh Chen and Ming-Syan Chen, "HiClus: Highly Scalable Density-based Clustering with Heterogeneous Cloud," Elsevier , p. 149â€“157, 2015. 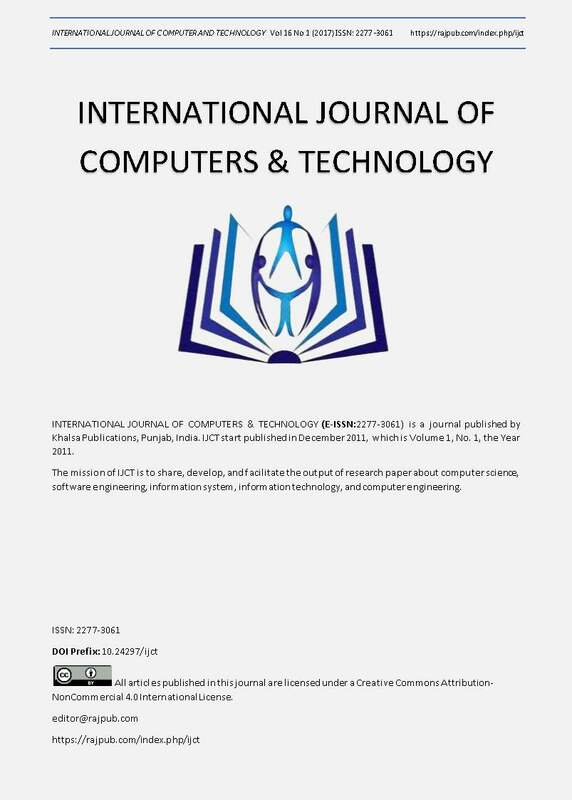 Atul Vikas Lakra and Dharmendra Kumar Yadav, "Multi-Objective Tasks Scheduling Algorithm for Cloud Computing Throughput Optimization," Elsevier, p. 107 â€“ 113, 2015. Geethu Gopinath P P and Shriram K Vasudevan, "An in-depth analysis and study of Load balancing techniques in the cloud computing environment.," Elsevier, p. 427 â€“ 432, 2015. Ruitao Xie, Yonggang Wen, Xiaohua Jia and Haiyong Xie, "Supporting Seamless Virtual Machine Migration via Named Data Networking in Cloud Data Center," IEEE, pp. 1-14, 2013. Byung Chul Tak, Youngjin Kwon and Bhuvan Urgaonkar, "Resource Accounting of Shared IT Resources in Multi-Tenant Clouds," IEEE, pp. 1-14, 2015. Danuta Sorina Chisca, Ignacio Casti, Deepak Mehta and Barry Oâ€™Sullivan, "On Energy- and Cooling-Aware Data Centre Workload Management," IEEE, pp. 1111-1114, 2015. V. Tyagia and T. Kumar, "ORT Broker Policy: Reduce Cost and Response Time Using Throttled Load Balancing Algorithm," Elsevier, p. 217 â€“ 221, 2015. Song Wu, Yaqiong Peng and Hai Jin, "Time Donating Barrier for efficient task scheduling in competitive multicore systems," Elsevier, pp. 469-477, 2016. Jia Zhao, Kun Yang, Xiaohui Wei, Yan Ding, Liang Hu and Gaochao Xu, "A Heuristic Clustering-based Task Deployment Approach for Load Balancing Using Bayes Theorem in Cloud Environment," IEEE, pp. 1-14, 2015. Xiang Deng, , Di Wu, Junfeng Shen and Jian He, "Eco-Aware Online Power Management and Load Scheduling for Green Cloud Datacenters," IEEE, pp. 1-10, 2014. Zhi Zhou, Fangming Liu, Ruolan Zou, Jiangchuan Liu, Hong Xu, and Hai Jin, "Carbon-aware Online Control of Geo-distributed Cloud Services," IEEE, pp. 1-14, 2015. Gongzhuang Peng, Hongwei Wang, Jietao Dong and Heming Zhang, "Knowledge-Based Resource Allocation for Collaborative Simulation Development in a Multi-tenant Cloud Computing Environment," IEEE, pp. 1-13, 2015. Weiwei Kong, Yang Lei and Jing Ma, "Virtual machine resource scheduling algorithm for cloud computing based on auction mechanism," Elsevier , pp. 1-6, 2016. Amir Nahir, Ariel Orda and anny Raz, "Replication-based Load Balancing," IEEE, pp. 1-14, 2015. Jin Yang, Jianmin Pang, Ning Qi and Tao Qi , "On-Demand Self-Adaptivity of Service Availability for Cloud Multi-Tier Applications," IEEE, pp. 1237-1240, 2015.